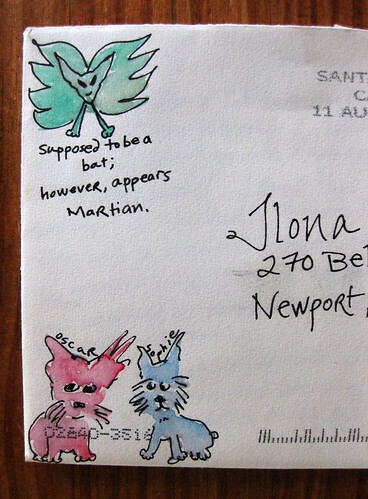 This fabulous correspondent not only made drawings on the envelope, but it looks like she watercolored them! Her dogs are at the bottom, and on the top she gave me a letterbat. I enjoy her commentary as much as the artwork. oh yes great mail art that is awesome . I just got through doing some mail art on a return letter myself yeah !!! that is just awesome . thanks for sharing and posting this . I LOVE the dogs! So cute. Wonderful mail art!!! I really like the way how the dogs are drawn and painted! I love watercolor. I wish I had that talent.